My first freak out of the day was when I put my pack on and it felt waaayyy too light. After unpacking, checking and rechecking that I had everything, I’m going to say the past few months of cross-fit class have paid off with some extra strength. I’ll take it! Especially, since I’m an obsessive water packer. It was a humid day and I’d need it! 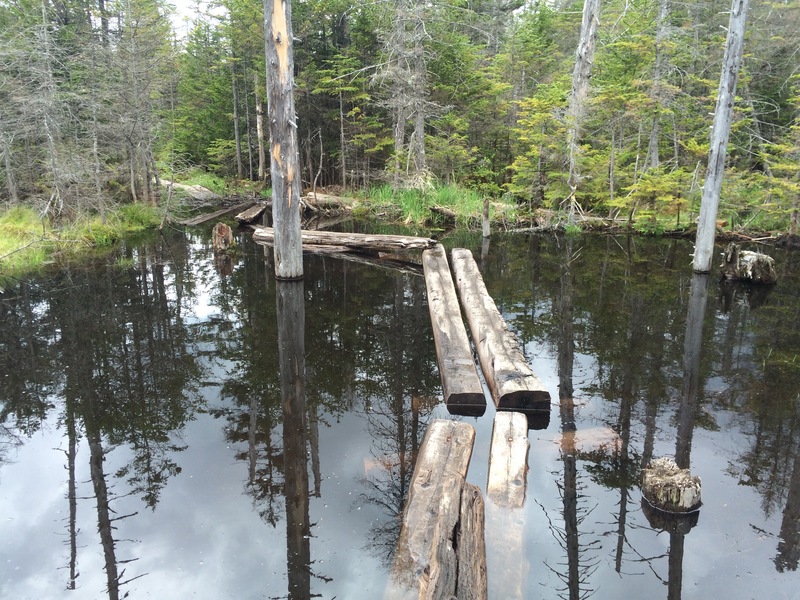 It turned out to be national trail day with ADK46 and the Adirondack Mountain Club. Thank you, thank you, thank you to all the trail masters, volunteers and everyone that helps with maintenance. You are simply all kinds of awesome. I wasn’t carrying boards for bridges – but I did grab a few rocks for the summit of Skylight to help define the path and protect the alpine zone. Starting out on the Van Hovenberg Trail it was straight forward, well worn and easy. Lots of traffic, that isn’t my favorite but expected for the most popular route to Mt. Marcy on such a perfect day. After crossing Marcy Brook, and swinging back up to the dam you’re 2.3 miles in. Just past the trail register, bear right to take the Avalanche Pass Trail to the right. The next 1.1 miles goes smoothly – mostly flat, crossing a couple of small bridges but all pretty moderate and easy going. At 1.1 bear left to take the trail to Lake Arnold. The trail begins climbing along an old tote road high above Marcy brook for the next 1.1 miles. Nothing too challenging but the footing starts get rocky, with boulders, and I started to feel the humidity. At 1.1 you reach the junction to Indian Falls. Two hours, and 4.5 miles in, a perfect time for a snack – except for the non-stop bugs. From the Indian Falls junction the trail bears R, and continues to climb, increasing in intensity, rock boulders, and some mud. The hardest part to date. In another . 4 miles, you reach the split to Mt. Colden Trail. Staying straight, for the “last” push. You’ve gained 1200 feet from Avalanche Camp. This last push is where the mud starts to get real. You’ll bond with balancing on planks and logs by the end of the day. You then descend steeply – nothing can describe how much I hate giving up elevation gain. The next mile or so just dragged on and on for me. I was going way to slow, losing the motivation, especially considering the moderate trail. But eventually you’ll reach the bank of the Opalescent River and many, many board bridges. Note to self: when stepping on the zigzag type on the swamps area – beware that they are balancing on the next zag. So, yeah, the firmness in their balance isn’t really their strong point. But they get the job done – even if my first step was less than elegant. 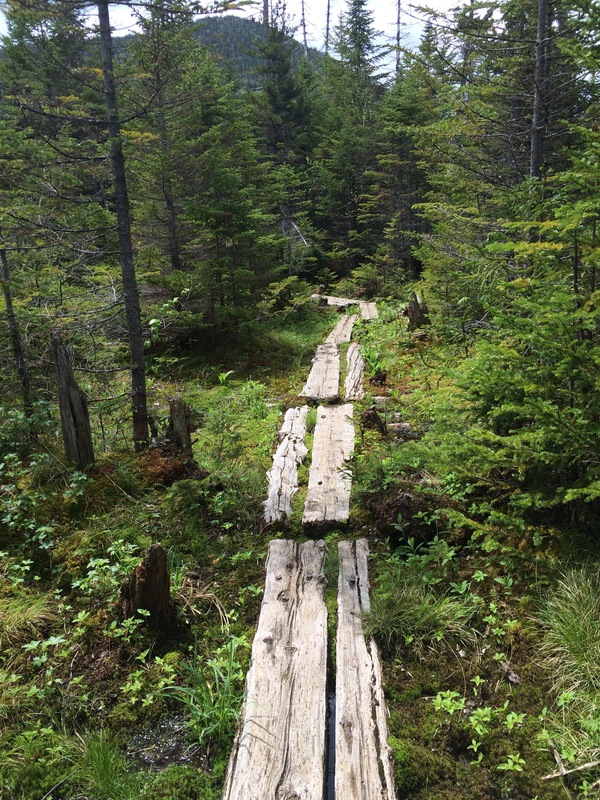 In total you’ve gone 1.7 miles since the split with Mt Colden Trail. Next time my mantra is gong to be just keep moving forward since it took longer and I was slower then it should of been for it’s length and difficulty. I blame it on the lack of sleep. 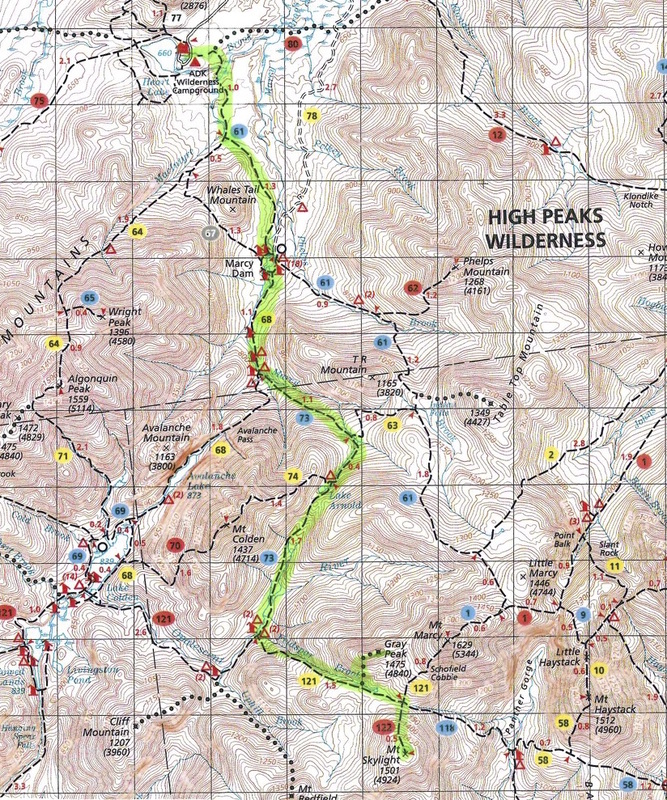 Once reaching Feldspar Brook (and lean-to) follow the yellow markers to the trial toward Marcy (left), opposed the trail to Colden Lake (red/right). The trail soon begins climbing at a moderate grade, crosses a stream, and beings a steady, steep climb (again). Once it levels off you’re close the outlet to the Lake Tear of the Clouds – the highest pond source of the Hudson River. Congrats. You’re at 4,346 feet! Just before the Lake you’ll see the classic carin pile marking the herd-path to Gray Peak. I highly recommend doing Gray Peak first. It’s harder, muddier, longer and has less of a view. Save Skylight! Gray starts easy-moderate, crosses a stream or two, descends, climbs over a ridge, and then heads up to the summit. The last section gets pretty wet, muddy, broken trail, steep and a couple of big cliffs that have a trail going to the right. I wish I had noticed – but I got some extra scramble skills and scaled one of them (gulp!). Once it levels off, and one last boulder to climb, you’re nearly there. A view ledge to your right, then to your left, and just a few more yards and you’re at the view-less summit. Wooohoo! Yep. You don’t need to climb this. But I did. Scramble skills practice. Better than climbing the scrambles. Sure. 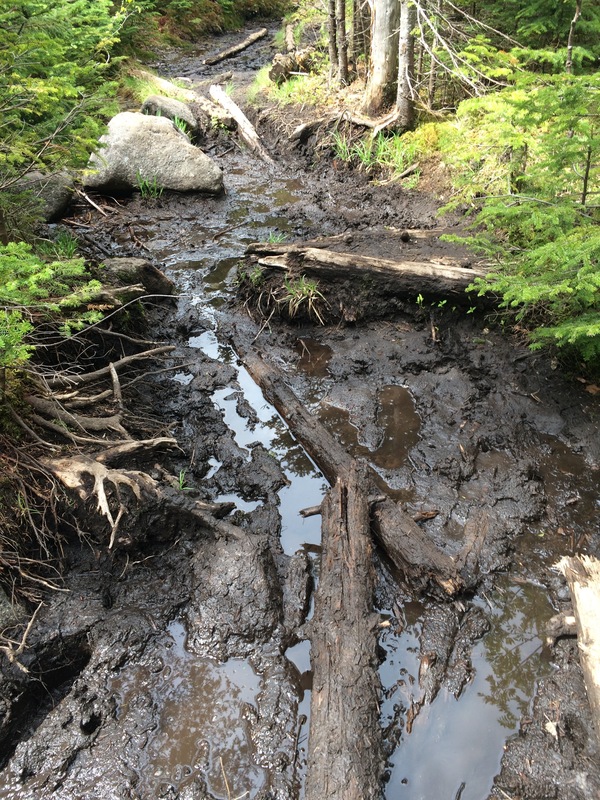 I love a muddy, slippery, decline. I enjoyed my break at the first viewing ledge I passed. A much better view than I anticipated – but doesn’t hold a candle to Skylight. I moved pretty slow and made it up in about 45 minutes from the outlet at Lake Tear of the Clouds. A quick jaunt back down, following the Lake for another . 3 miles, headed toward Marcy, before the junction with the Skylight trail. There is also a toilet just past the trail. It is a bald summit so go now or forever hold your peace. Skylight is nothing too bad. Sure, you’ll sweat but compared to Gray it is a walk in the park. About . 5 miles in total with moderate inclines, getting into some slipper chutes by the end, and then you hit the tree-line and follow the carin’s. Per usual it is longer than you think. You have to reach the farthest carin that you can see from the treeline to see that there is still more, but you can’t miss the massive rock pile at the summit. Skylight does not disappoint! A massive summit, with amazing views in all directions. One to soak up and enjoy. With one other person on the summit for only a few minutes – I basically had it all to myself. Perfection. I heard only the wind and adk gods. I ignored my inner voice about dark and the hike out. The calm is why I come. I hiked out faster than I thought. Sure it took hours and slow on the “rock” portions of the trails. My feet were sore – and stayed sore for days – but with the knowledge of the trail and something mental about being headed out and no more energy to save. I came out with the last of twilight dimming and squeaked by without using my headlamp. 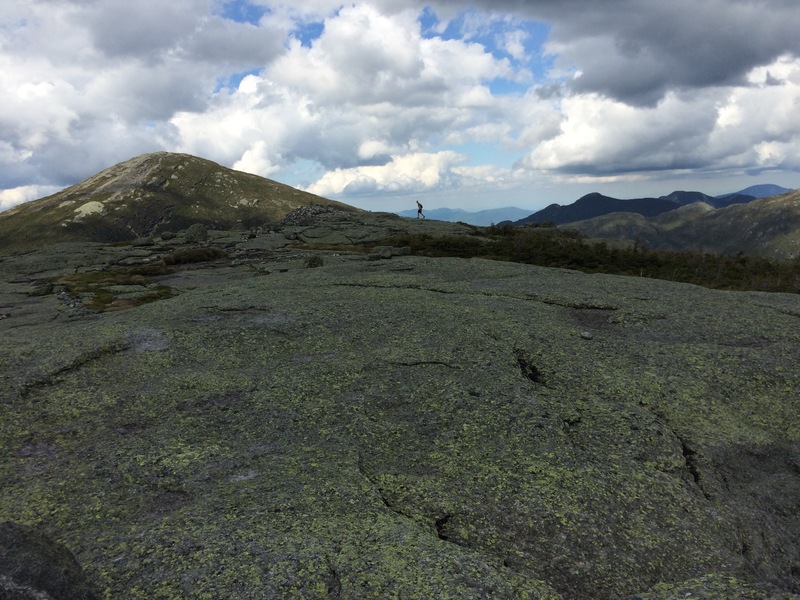 All day I had the inner monologue with the ADK Gods – love, hate, love, peace, am I there yet, exhaustion, hate, acceptance, and then the summit. I’d be remiss if I didn’t mention that a few somber thoughts seeped in while hiking these two. Last year, while hiking Street and Nye I had my least favorite river crossing. I lost my iPhone but was safe and sound. The night before a woman was not so lucky. She lost her life on this exact hike. I had perfect conditions for Gray & Skylight – while she had flash flooding. When I reached the the crossing where I believe she fell in, it was heavy. One of my favorite hikes to date – but my heart goes out to her and her family. And while there are low numbers of casualties – nothing is zero in the wilderness. I certainly learned my lesson, and have done so much more research on rivers, flooding and river crossings. A friend recently asked if I was introverted upon hearing me talk about the hike. Interesting, because most people know me as being incredibly outgoing and social. BUT truth be told I’m both. I’m very social (and loud) but I also need a fair amount of just me time. When I’m on and with peeps I’m full force but I want a good chunk of time – consistently – of solitude. Hence the enjoyment in 12 hour days in the wilderness just to myself. And, yes I’m that person that takes a break for a group to pass to have the “mountain” to myself. Thanks again to the ADK gods. I’ve missed you. I needed you. Glad to be back amongst your graces. #41 and #42 done and down to the final 4! Let’s hope the next on deck – Redfield and Cliff – treat me as well. So many brook crossings. So little time. Let the boulder and rocks begin! A taste of mud. It is the ADKs after all. Do not trust the balance. Each section balances on the next. So far – yet so much to do. Rocks – not my fastest. Gray Summit. I made it! 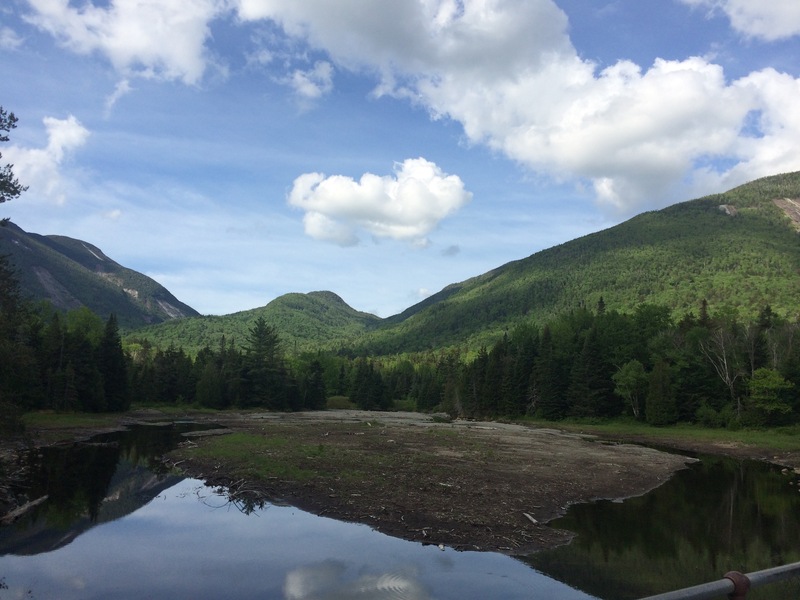 This entry was posted in Uncategorized and tagged Adirondack High Peaks, Adirondack Mountain Club, ADK Loj, ADK46, Avalanche Pass, Feldspar Brook, Gray Peak, herd path, Hiking, Hudson River, Indian Falls, Lake Arnold, Lake Tear of the Clouds, Marcy Brook, Marcy Dam, Mt. Colden, Mt. Marcy, Mt. Skylight, Opalescent River, Summit, Trail, Van Hovenberg Trail. Bookmark the permalink.